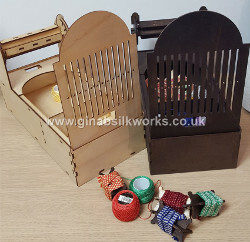 How to warp a tape loom using the assembled loom from the Gina-B Silkworks Tape Loom Kit . The loom in this film has been stained and waxed after being assembled to achieve the 18th century look (it is also the prototype - the final kit has a flat base). Warping is with perle (pearl) cotton size 5 and 1m lengths to show the process. This short tutorial shows you how to make a quick and simple flower using one of the Flower Comb ribbon ruching tools from Gina-B Silkworks. The principle is the same for all of the double-edged tools, allowing for a variety of different flower types with no effort.